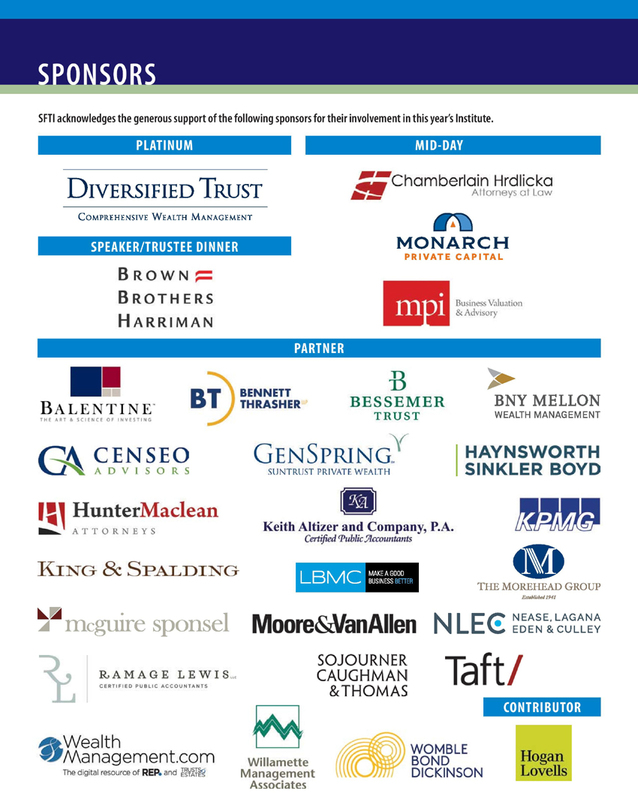 The SFTI Trustees would like to thank the firms below for their participation as a Sponsor at the 2018 Southern Federal Tax Institute. Chamberlain Hrdlicka is a diversified business law firm with offices in Houston, Atlanta, Philadelphia and San Antonio. The firm represents both public and private companies as well as individuals and family-owned businesses across the nation. In addition to tax planning and tax controversy, the firm offers corporate, securities and finance, employment law and employee benefits, energy law, estate planning and administration, intellectual property, international and immigration law, commercial and business litigation, real estate and construction law. Brown Brothers Harriman Trust Companies, N.A. At Brown Brothers Harriman our purpose is straightforward: to protect and grow our clients’ capital. We start with a deeply rooted investment culture and combine that with unparalleled localized delivery of fiduciary services through the firm's two domestic national trust companies and the firm's Cayman trust company. The firm's tradition of stability and longevity created by our general partnership structure underpins every aspect of our interaction with our clients. For more information, visit www.bbh.com. Balentine is an independent wealth management firm that provides investment management and financial planning services to entrepreneurs, high-net-worth individuals, and institutions. Balentine is dedicated to providing peace of mind and performance to clients through its goals-based approach. Since its founding in the depths of the financial crisis nine years ago, Balentine’s staff has doubled to 35 professionals and assets under advisement have grown to more than $3 billion. Balentine is headquartered in Atlanta and has a second office in Raleigh, North Carolina. Currently ranked among the largest CPA firms in the U.S., Bennett Thrasher is a premier provider of professional tax, assurance, consulting and wealth management services to businesses and high net worth individuals. Since 1980, our integrity has earned our clients’ trust, and our culture of supporting professional and personal growth has created a long-term, dedicated team. For more information, please visit www.btcpa.net. Bernstein was founded 50 years ago to manage money for families and individuals. We now serve smaller institutions as well. For many clients, we deliver a uniquely integrated approach to managing all or most of their liquid assets. For others, we deliver services that are targeted to fill a specific need. But all our clients receive the benefit of our firm’s global scope, deep research resources, and planning expertise, and as legal fiduciaries, we place all clients’ interests first. For more information, please visit: www.bernstein.com. Privately owned and independent, Bessemer Trust is a multifamily office that has served individuals and families of substantial wealth for more than 100 years. Through comprehensive investment management, wealth planning, and family office services, we help clients achieve peace of mind for generations. Bessemer oversees more than $100 billion in assets for 2,400 clients, and we take pride in our continued private ownership, singular focus on wealth management, alignment of interests among clients, owners & employees, and culture of service. BNY Mellon is the world's largest multi-boutique investment manager, encompassing BNY Mellon’s globally diversified investment boutiques, wealth management and global distribution companies. We combine the scale of a full-service investment manager with the focused expertise of autonomous investment boutiques, each with their own style, strategy and management team. For more information please visit https://www.bnymellon.com/. Censeo Advisors is a professional services firm delivering proven business valuation, financial advisory, real estate and tangible asset appraisal, and forensic analysis services. We assist clients in many market sectors, ranging in size from start-up businesses to Fortune 500 corporations, and located throughout the country. Our valuations are often used in connection with transaction consulting, tax planning and compliance, financial reporting, and litigation support matters. For those who believe the complexity of wealth should be managed to bring families closer together, GenSpring exists to be a collaborative community of individuals, families and committed professionals focused on growing wealth in support of the family’s enduring values. Our purpose is to objectively manage the issues that keep members awake at night so they can enjoy the moments in life that matter. GenSpring exclusively serves ultra-high net worth clients of SunTrust Private Wealth Management. Know more, GenSpring.com. Haynsworth Sinkler Boyd has more than 115 attorneys providing business, litigation and financial legal services to national and international clients. The firm’s tax group regularly advises clients with respect to federal, state and local tax matters. Our attorneys also assist shareholders, directors, officers and members of LLCs in implementing creative, tax-efficient strategies for expansion, benefit packages, ownership succession, reorganizations, mergers and acquisitions. The firm’s estate planning group focuses on the preservation and orderly disposition of family wealth through the use of wills, testamentary substitutes and various tax-advantaged vehicles. They also represent individuals, banks and trust companies in probate litigation. Firm offices are located in Charleston, Columbia, Florence, Greenville, and Myrtle Beach, South Carolina. For more information, visit www.hsblawfirm.com. HunterMaclean offers one comprehensive source to handle the full range of business legal needs. From offices in Savannah and Brunswick, the firm provides legal services throughout the southeast in more than thirty practice areas to clients that include Fortune 500 companies, banks, hospitals, professional service organizations, nonprofit corporations, privately-held businesses, and start-up ventures. Since 1897, HunterMaclean has worked to build long-term, strategic relationships to help clients navigate the constantly evolving business landscape. For more information, please visit: www.huntermaclean.com. Keith Altizer and Company, P.A. has been serving Central Florida and beyond for over 45 years. The firm is a full service public accounting firm providing high quality, proactive and personable services in the areas of tax consulting and compliance, business valuation, accounting and auditing as well as litigation support for high net worth individuals, partnerships, corporations, estates, trusts, private foundations and other non-profit entities. Celebrating more than 130 years of service, King & Spalding is an international law firm that represents a broad array of clients, including half of the Fortune Global 100, with over 1,000 lawyers in 20 offices in the United States, Europe, the Middle East and Asia. The firm has handled matters in over 160 countries on six continents and is consistently recognized for the results it obtains, uncompromising commitment to quality, and dedication to understanding the business and culture of its clients. For additional information, visit www.kslaw.com. KPMG LLP, the audit, tax and advisory firm (www.kpmg.com/us), is the U.S. member firm of KPMG International Cooperative ("KPMG International"). KPMG International’s member firms have 155,000 professionals in 155 countries. Our high performing people mobilize around our clients, using our expertise and insight to cut through complexity and deliver informed perspectives and clear solutions that our clients and stakeholders value. Our client focus, commitment to excellence, global mindset and consistent delivery build trusted relationships that are at the core of our business and reputation. For additional information, visit www.kpmg.com/us. LBMC, PC is among the largest CPA firms in the Southeast with offices in Nashville, Knoxville and Chattanooga. The Firm serves a wide range of industries and companies varying from start-up to large publicly traded companies, as well as high-wealth family groups. LBMC has a robust tax division with expertise and resources in tax strategy and compliance, state and local tax services, wealth management, gifting and estate strategies – as well as other traditional accounting, human resources, technology and operational services. For more information, visit www.lbmc.com. With 21 primary practice areas, a long history of civic service, and noted national, regional and local clients, MVA ranks among the Southeast's preeminent and fastest growing full-service law firms. MVA’s Wealth Transfer group, one of the largest and most experienced private wealth practices on the East Coast, provides sophisticated, proactive and personable estate, tax, charitable and business planning for its clients–high net-worth individuals and families, senior executives of public companies and closely-held businesses. Since 1941, professionals with The Morehead Group have provided strategic life insurance solutions to affluent individuals, families and closely-held businesses. The firm collaborates with the client's team of planning professionals to design, implement and administer comprehensive life insurance plans. The firm’s proprietary processes provide comprehensive plans, collaborative focus and confidence to our clients. The Morehead Group is a member firm of Partners Financial, a national organization of select life insurance professionals. Ramage Lewis LLC provides specialized estate and financial (tax) planning and tax compliance services for high net worth individuals and executives, their families, as well as their related entities, including family partnerships, trusts, estates and private foundations. Our firm size allows us to provide a niche service to a select client base, which seeks proactive, individualized attention. We are here to assist our clients navigate the complexities of financial planning and related tax issues. Additionally, we often serve as the hub for the planning process, working with the attorney, investment counsel, and other advisors to ensure all aspects of financial planning, estate planning, and tax planning and compliance are coordinated. Sojourner Caughman & Thomas is a Columbia, South Carolina law firm focused exclusively on trust and estate matters. With a highly-respected team of seven attorneys, we bring credentialed expertise and the value of extensive client experiences to every family wealth transfer situation. We provide thoughtful and well-informed recommendations that foster long-term client relationships in an environment that is professional and discreet. With more than 400 attorneys, Taft has offices in Chicago, Illinois; Cincinnati, Cleveland, Columbus and Dayton, Ohio; Indianapolis, Indiana; Covington, Kentucky; and Phoenix, Arizona. The firm practices across a wide range of industries, in virtually every area of law, including Business and Finance; Litigation; Labor and Employment; Intellectual Property; Business Restructuring, Bankruptcy and Creditor Rights; Environmental; Health and Life Sciences; Private Client Services; Real Estate; and Tax. Contact: Michael Laing at laing@taftlaw.com or (513) 357-9385. WealthManagement.com is the new digital resource of REP. and Trusts & Estates that’s specifically designed to help financial advisors and estate planning professionals stay knowledgeable about the latest investment ideas, industry data, legal and tax issues, and market trends needed to build and maintain strong client relationships. It provides valuable tools that help them better manage the daily activities of their practice, connect with essential members of the community, and be more effective in growing their business. Wilmington Trust is a premiere provider of wealth management services. With more than 100 years of fiduciary expertise at the core of everything we do, we manage relationships with individuals, families, business owners, and corporations with a long-term view. Our industry experts are committed to providing high-quality service, and customized, goals-based solutions—all within an advanced framework to mitigate and manage risk. For more information about the Wilmington Trust difference, visit www.wilmingtontrust.com. Womble Bond Dickinson LLP is a full-service business law firm perennially listed among the leading U.S. firms by American Lawyer magazine. Extraordinary client service is a hallmark of Womble Bond Dickinson We provide value to our clients by combining professional skill, technology, and a thorough understanding of our clients' needs to deliver high quality, cost effective and responsive services. Founded in 1876, the firm serves clients nationally and globally with more than 1,000 attorneys in 26 offices throughout the Southeast and Mid-Atlantic regions, and in Silicon Valley. For more information, visit www.womblebonddickinson.com/us. Hogan Lovells is a global legal practice that helps corporations, financial institutions, and governmental entities across the spectrum of their critical business and legal issues globally and locally. We have over 2,500 lawyers operating out of more than 40 offices in Africa, Asia, Europe, Latin America, the Middle East, and the United States. Our style is open, service focused, and friendly. We believe that our commitment to client service, commerciality, and teamwork provides benefits to our clients and enhances effective business relationships.